Looking out over the main square in beautiful Krakow. That’s St. Mary’s Basilica on the left. This is just one side of the square — on the other side of that building (the one with all the arches), there was a whole other open area. 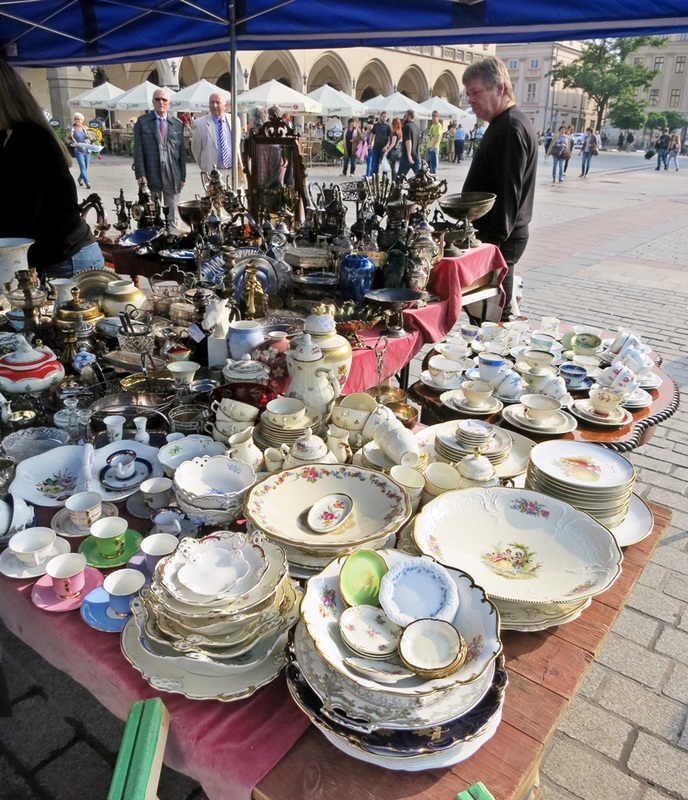 It dates back to the 13th century, and is the largest medieval town square in Europe. The Project for Public Spaces even lists the square as the best public space in Europe due to its lively street life. 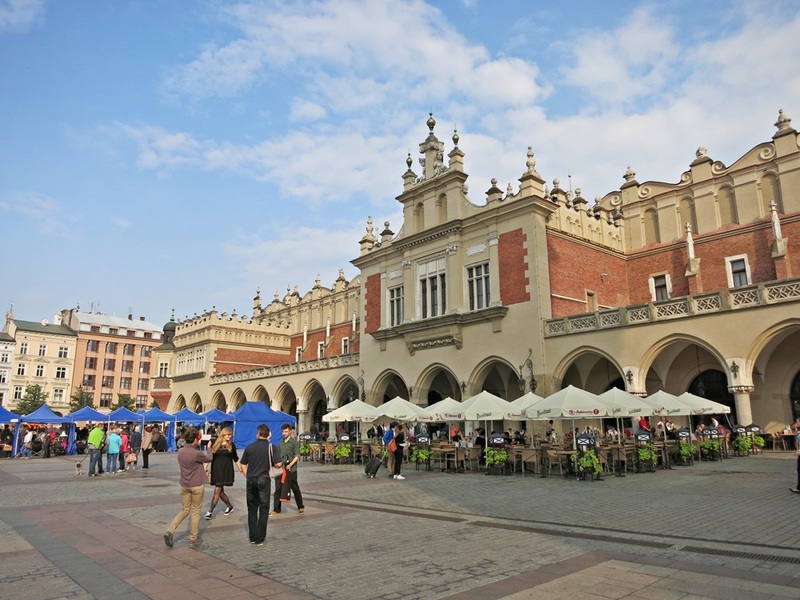 One side of the main square in Krakow. 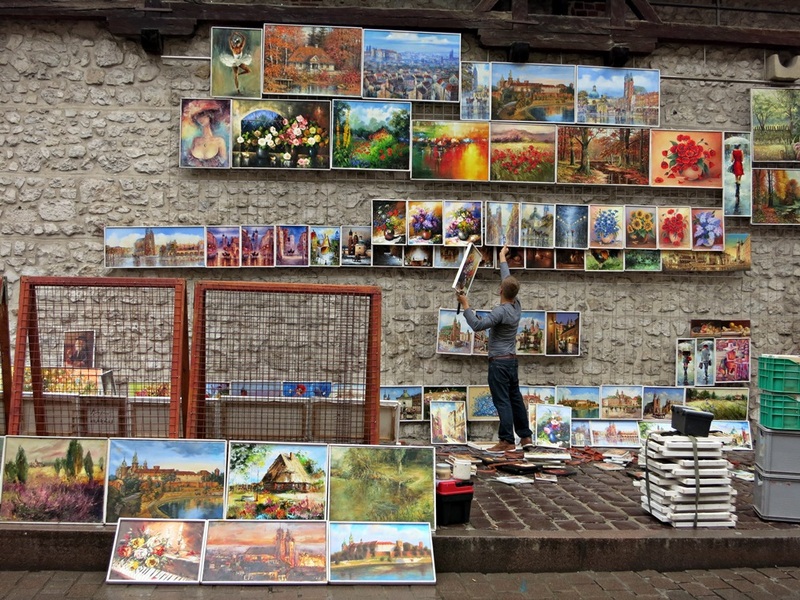 Krakow, unlike most other European cities, managed to survive WWII relatively unscathed thanks to its role as the capital of Germany’s General Government during the war, and today it’s full of horse-drawn carriages, pigeons, and meat stalls that glow with beacon-like allure at night. Meat for sale in the market. Lots of meat. I didn’t eat any of the meat, but I did enjoy a bowl of mushrooms from one of the stall’s many troughs. Undoubtedly they were marinated and slow-roasted in some sort of pig or beef tallow, but what you don’t know for sure doesn’t count. 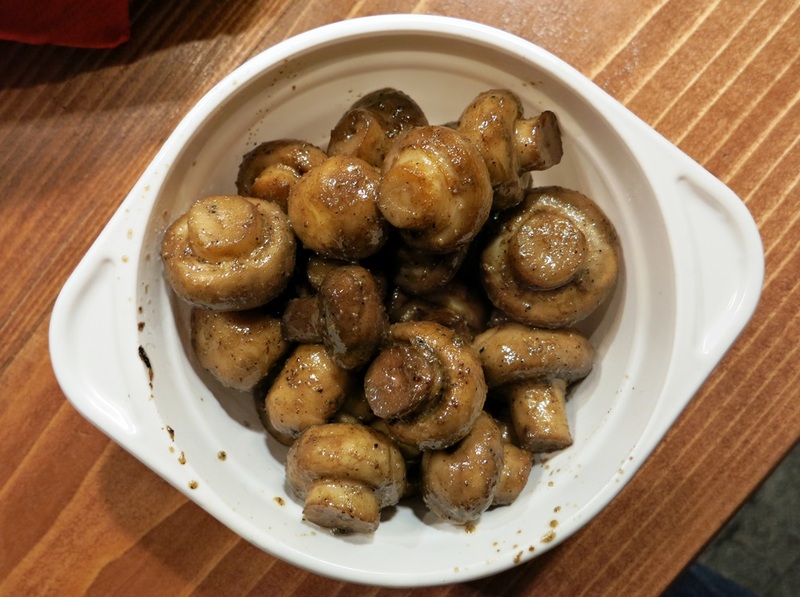 What I DO know is that these mushrooms were amazingly delicious. Seasoned, tender, fungi-perfection. 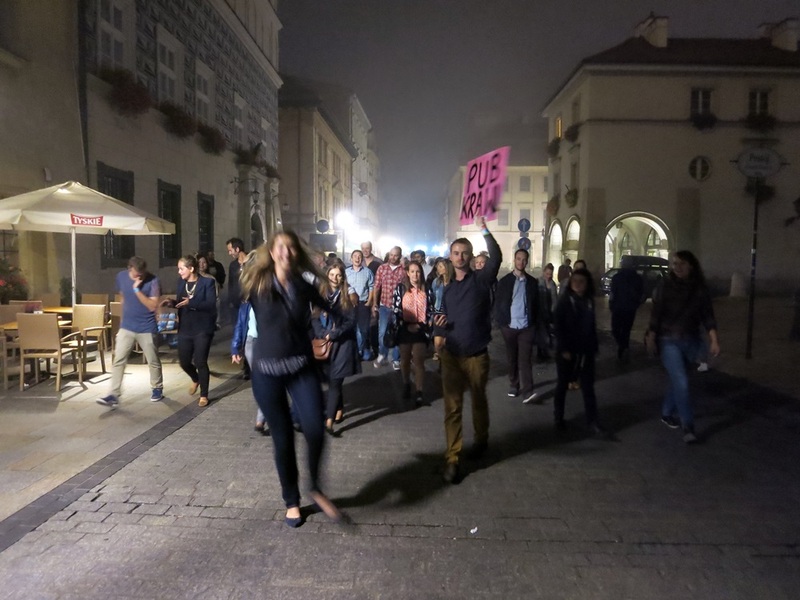 On our first night in Krakow, our group went out for dinner and then on a Pub Crawl (Pub Krawl — in Krakow, the K’s are done Kardashian-style), stopping at several downtown pubs for free shots and mixed drinks. I went home in the fog after the 4th bar with wonderful Aussie couple Dustin and Hannah, but not everyone followed suit. There were some sad and sick faces the next morning. The Krakow pub crawl kicks off! 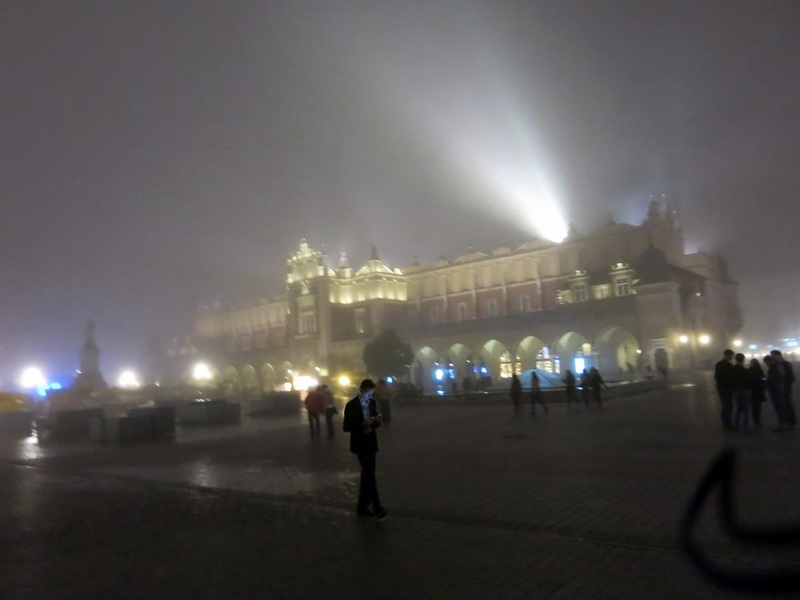 Foggy, lovely Krakow. The main square at night. 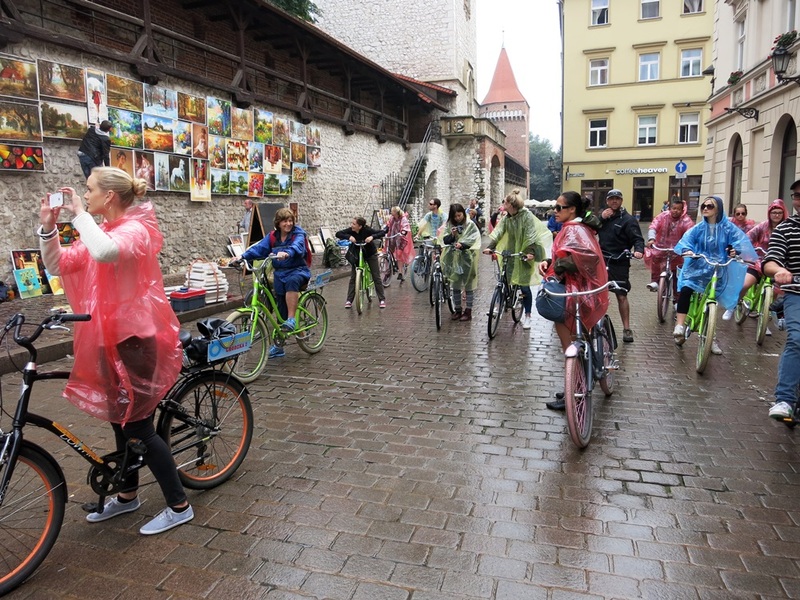 Nothing like a rainy day for biking the slick cobblestone streets of an ancient European city! Also, excellent side-eye from Charlotte in this photo. One of the first stops on the tour included the brick St. Mary’s Basilica in the main square, originally built in the early 13th century. See that tiny speck in the top middle window on the right-hand side? It’s a horn. 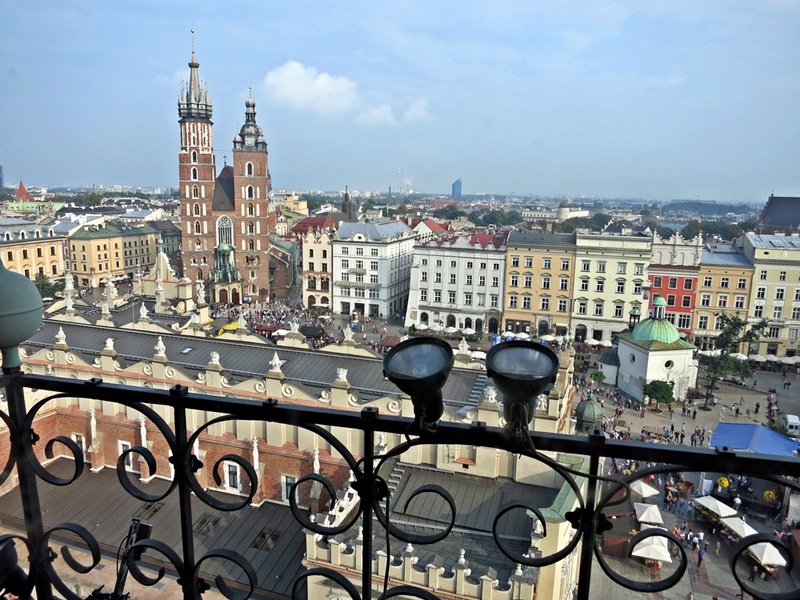 Every hour, on the hour, a trumpeter plays the Hejnał Mariacki, or Krakow Anthem, out of four separate windows to each “corner” of the city. Listening to the Hejnal Mariacki from St. Mary’s Basilica. One thing I liked in Krakow was how, at every major historic site, an exact miniature replica was also nearby for the visually impaired to touch and feel. The pigeon poop (especially in Krakow) is inevitable, but it’s still such a thoughtful gesture. Well done, Krakow! 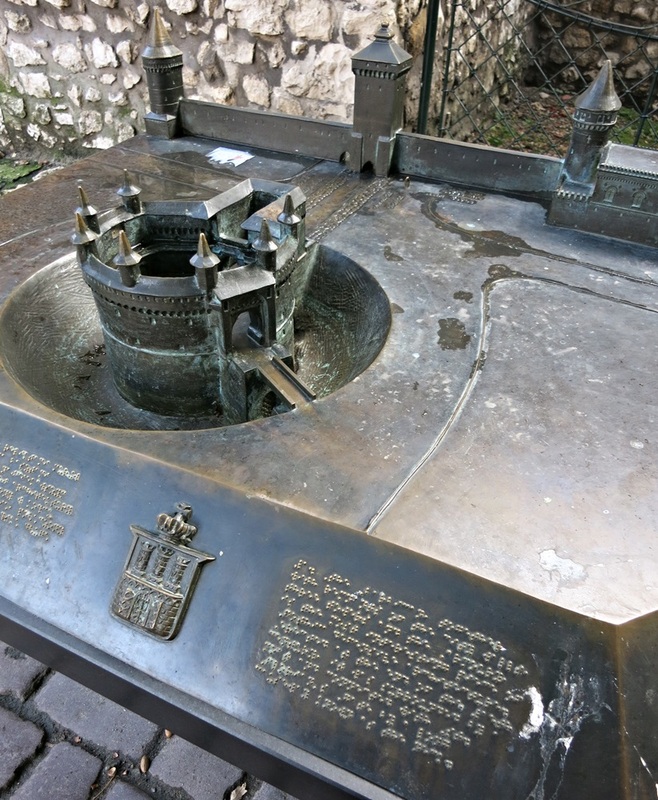 Replicas of tourist sites have been made for the visually impaired. Back on the bike tour, we looked like a cloud of pedaling gumballs, but it was a fun way to see a lot of the city in a small amount of time. The slick cobblestones, however, were not ideal. 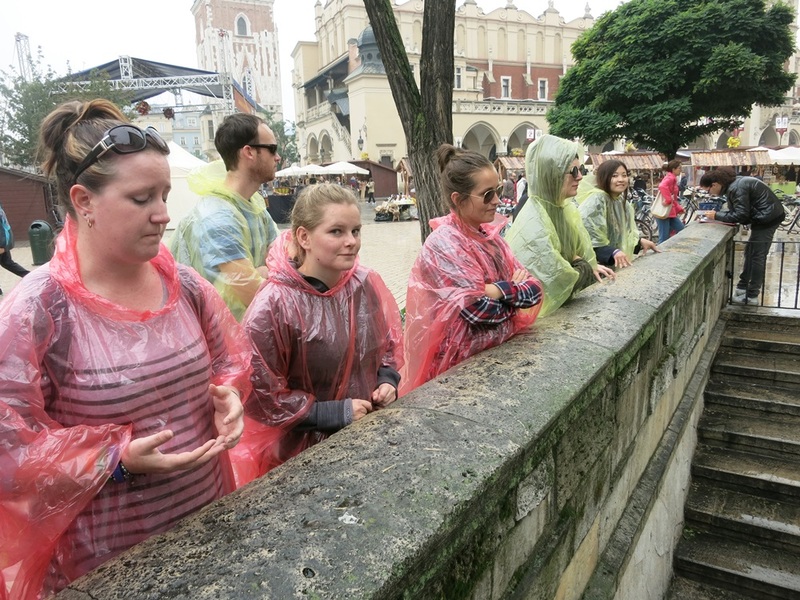 Krakow bike tour, poncho style. 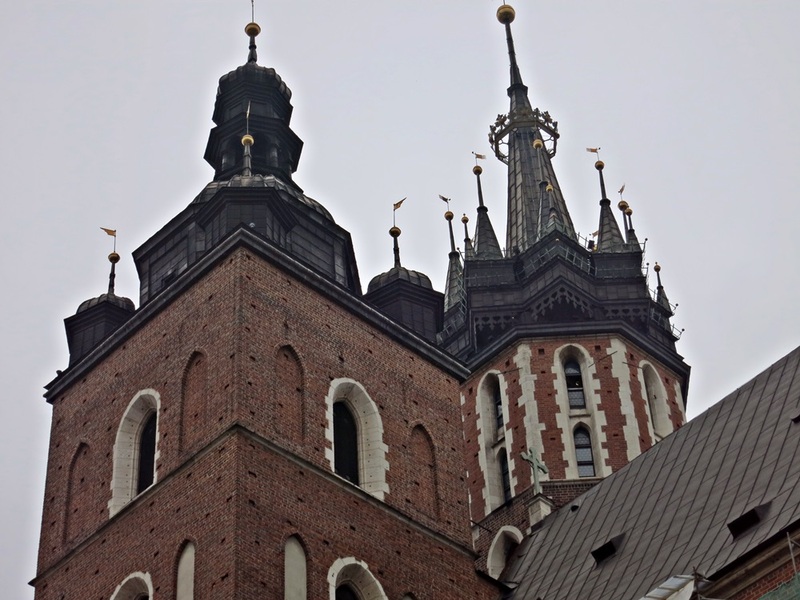 Another church stop on the Krakow bike tour. I should also note here that just about every city I visited (and even some of the bigger towns) had some form of love lock nonsense. Love locks, in case you don’t know, are a “current trend” (mostly in Paris) dating back to 2008 where a couple in love purchases a lock, writes their name and a date on the lock (optional), then clips it a famous bridge (usually) before throwing away the key forever…thus solidifying their love. 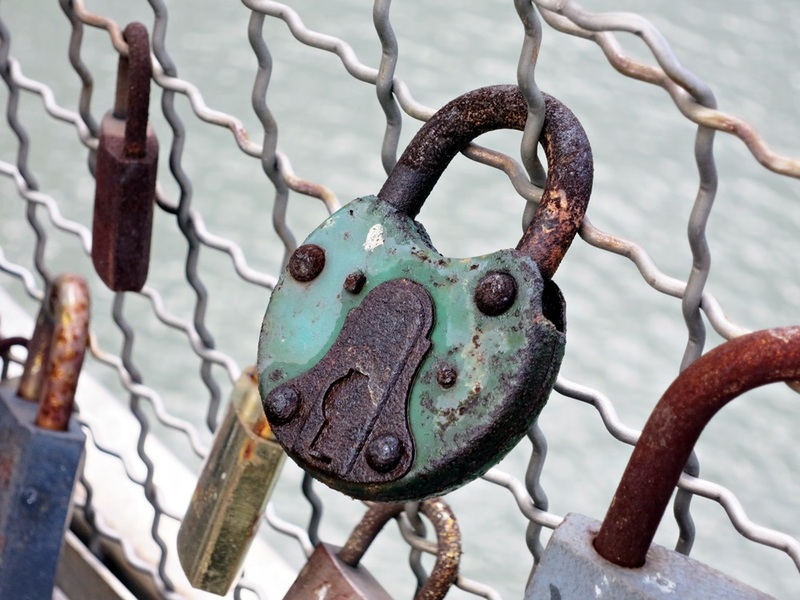 I know that many of you (including one of my favorite fictional couples) enjoy the love lock thing, and may have even strung up your own love lock somewhere in the world…but I hate them. Loathe them, even. I think they look like an ugly and rusted mess and, in some cases, they’re actually so heavy that parts of the railings on these beautiful old bridges give way under the weight. Rude! Also, I am not alone in my grumpy dislike, so there. Love locks (even pretty ones) in Krakow. Ugh. Let’s move on to Krakow’s Jewish memorial. 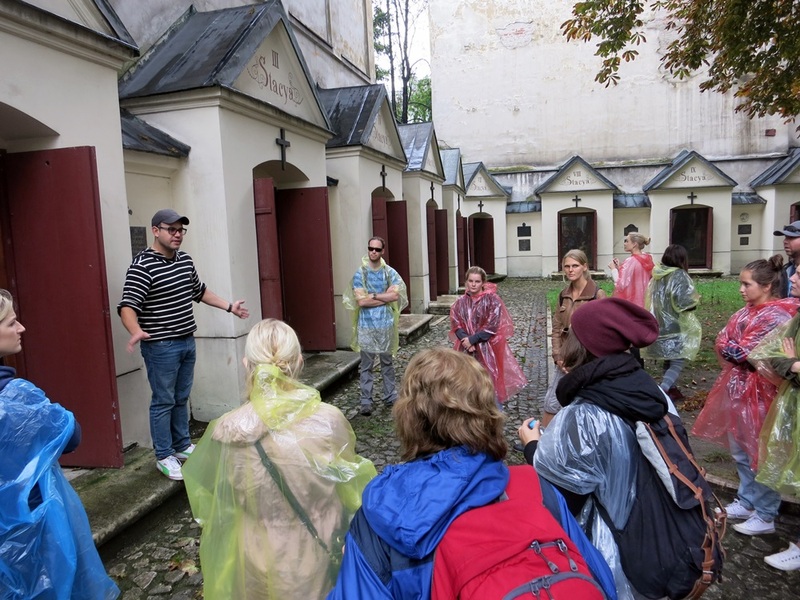 Approximately 56,000 Jews lived in the city on the eve of World War II, making up almost one-quarter of the city’s population, but by the time the Krakow Jewish ghetto was established in March of 1941, only about 15,000 remained. Some Jews from the Krakow ghetto were deported to Belzec or forced to work for the Germans, but after the Nazis liquidated the ghetto in March 1943, 4,000 were shot or sent to a forced labor camp, while the remaining 3,000 were deported to Auschwitz-Birkenau (where 2,450 were gassed upon arrival). The numbers are grim and, like all chapters of Jewish history from this corner of the world during this era, profoundly depressing. 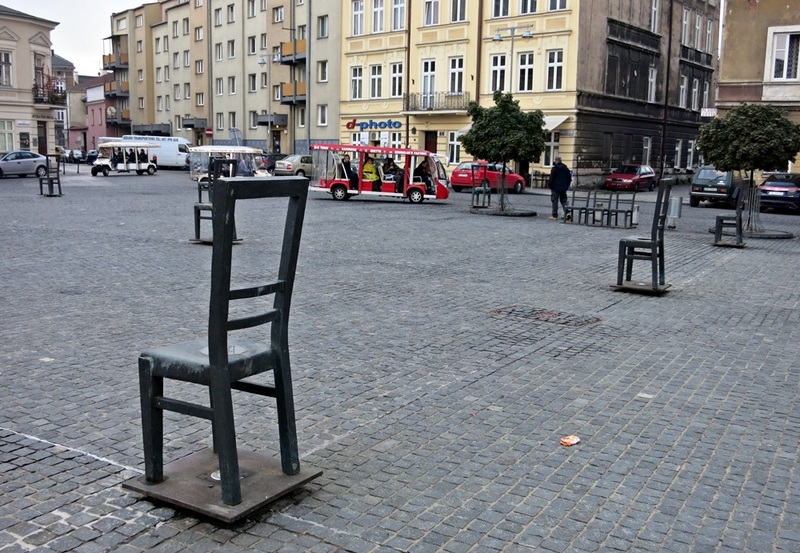 The 2005 memorial to the Jews of the Jewish ghetto in Krakow includes 33 steel and cast iron chairs in the square and 37 smaller chairs on the edge of the square and at public transportation stops. The chairs, empty and waiting for people who will never come home, is a simple yet strong idea…and sitting in one of the chairs (which you can do) further illustrates that anyone can fall victim to another person or regime’s hate. We also biked past (but didn’t go inside) Oscar Schindler’s enamel ware factory. Schindler, technically a German Nazi, is credited with saving the lives of 1,200 Jews by employing them in his factories and bribing SS officials to prevent their deportation and execution. By the end of the war, he’d spent his entire fortune on the costly bribes and was virtually destitute, although the Jewish community never forgot his sacrifice. When he died in October 1974 he was buried in Jerusalem on Mount Zion — the only member of the Nazi Party to be honored this way. Of course, we’re all familiar with the 1993 Steven Spielberg movie Schindler’s List, which was filmed on location in Krakow. 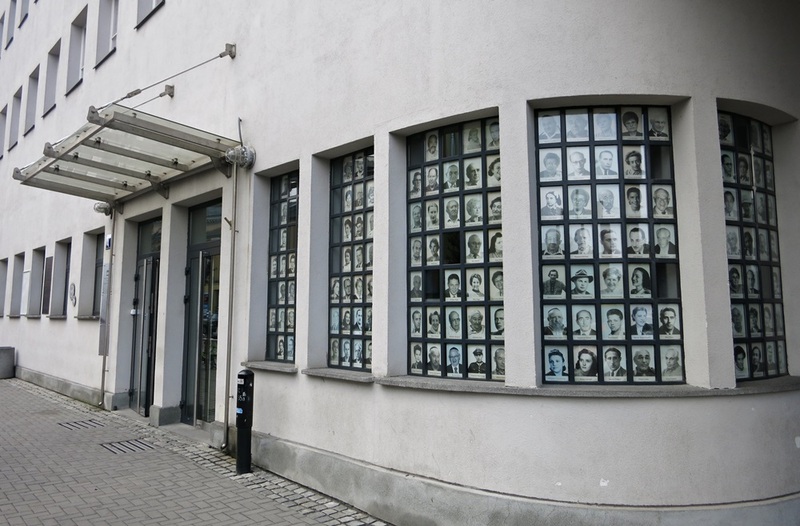 Today, the Schindler factory is a museum and its windows bear the photographs of Jewish survivors. Just one more example of something I’d only ever read about or seen in documentaries suddenly in front of me in real life. Just wonderful stuff. Oscar Schindler’s factory in Krakow. Back at the main square (the rain over), it was time for some traditional Polish folk music. How can you not love this? 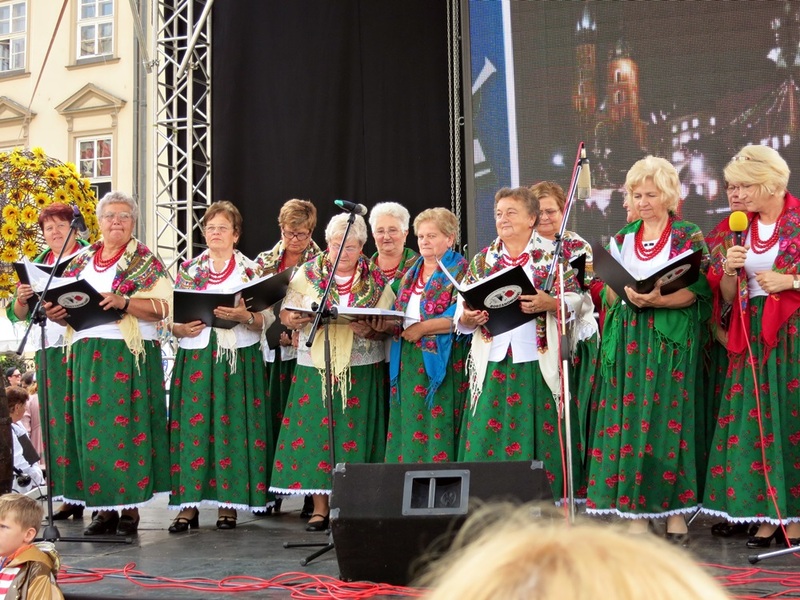 A Polish folk music performance. It was also time for lunch. 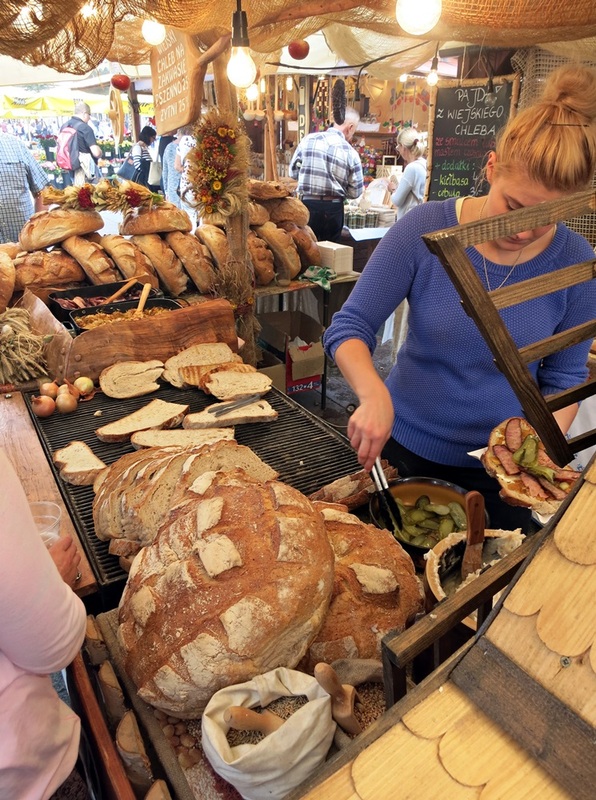 I stopped at a popular stall selling thick grilled country bread topped with your choice of lard (pass) or garlic butter (yes, please), plus caramelized onions, cucumbers (pickles), and/or sausage. I opted for just the garlic butter and onions. Plus beer. Delicious street food in the making. Behold the most beautiful and breath-offending offering! Thankfully, the cold beer helped wash it all down. Gum was also appreciated. 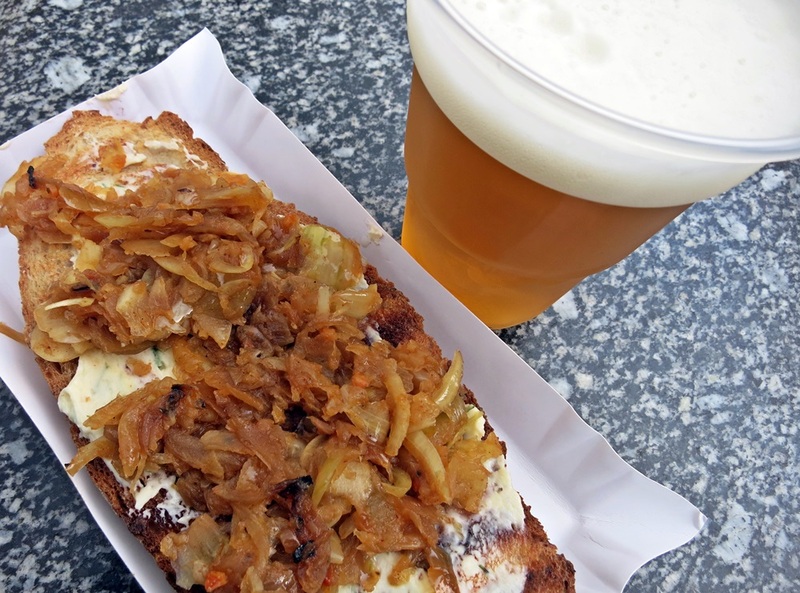 Beer, onions, bread….what else do you need? The big main building (the one with the arches) separating the two sides of the market is Cloth Hall — kind of like Faneuil Hall in Boston, but with the tourist shops rather than food down the main drag. 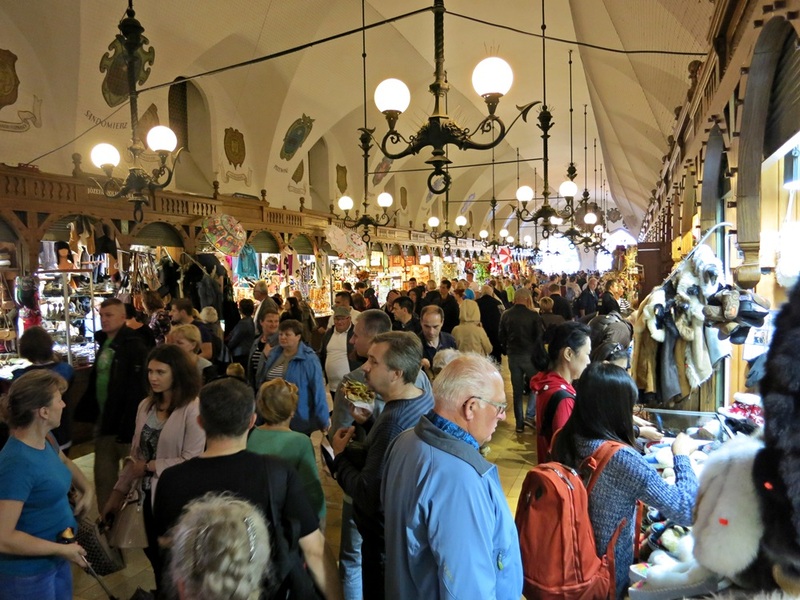 Full of typical tourist tchotchkes, it was fun to browse and people watch when the rain picked up again. 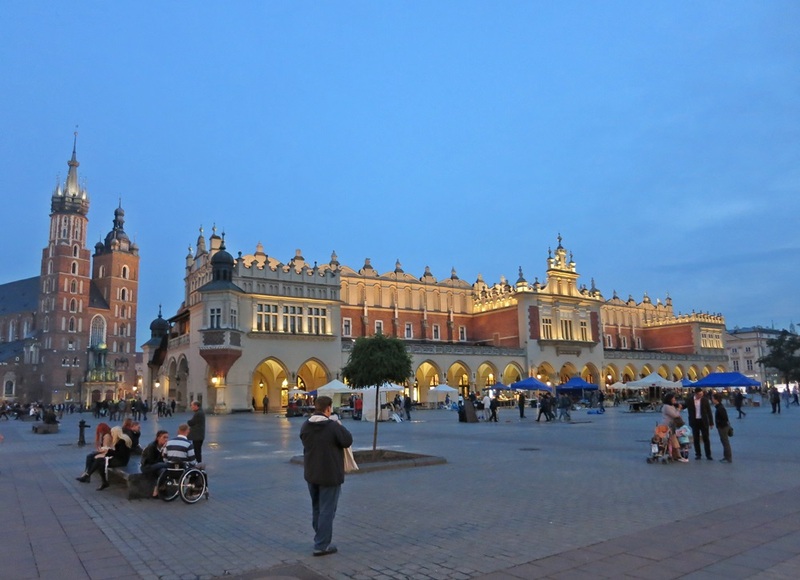 Cloth Hall in Krakow was rebuilt in 1555. 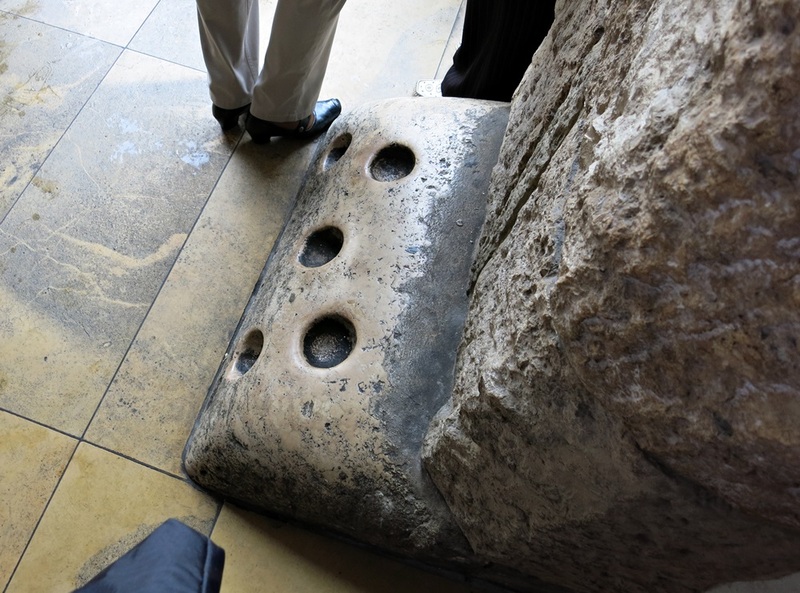 I was especially delighted with these holes near the entrance. Their original function? For putting out flaming torches before entering. That’s how old Cloth Hall is. TORCH-ERA old. Be still my history-loving heart. 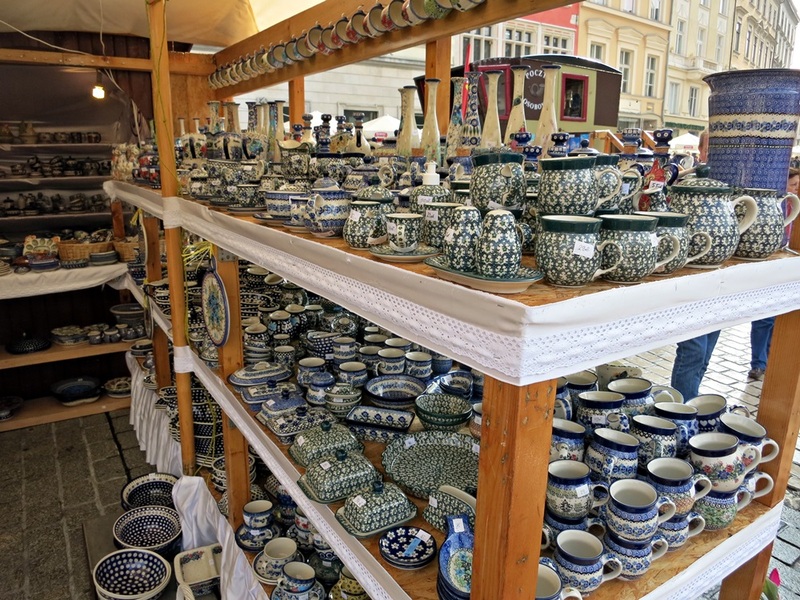 Being in Poland, there were (naturally) large displays of Polish pottery for sale. 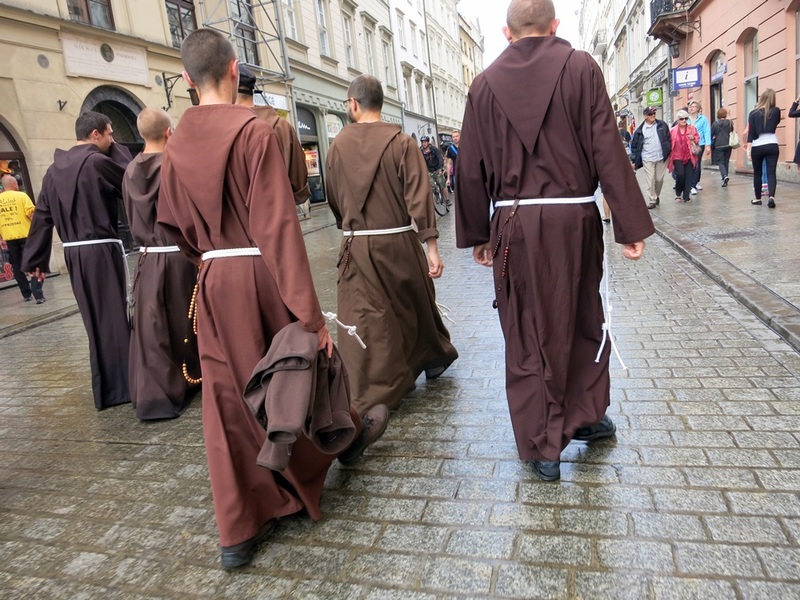 Krakow monks stroll the streets. 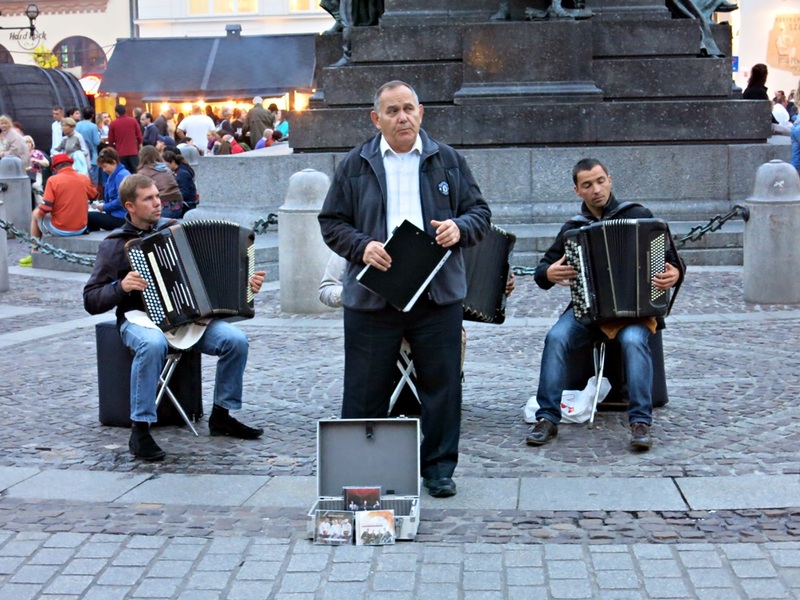 Then enjoy a performance of “Ave Maria” from these talented buskers. And delicious, sesame-crusted breads for the equivalent of not much more than pocket lint (1 zloty, or 28 cents). I cannot resist bread. Give me all the gluten. Also, please excuse my chipped nail polish. 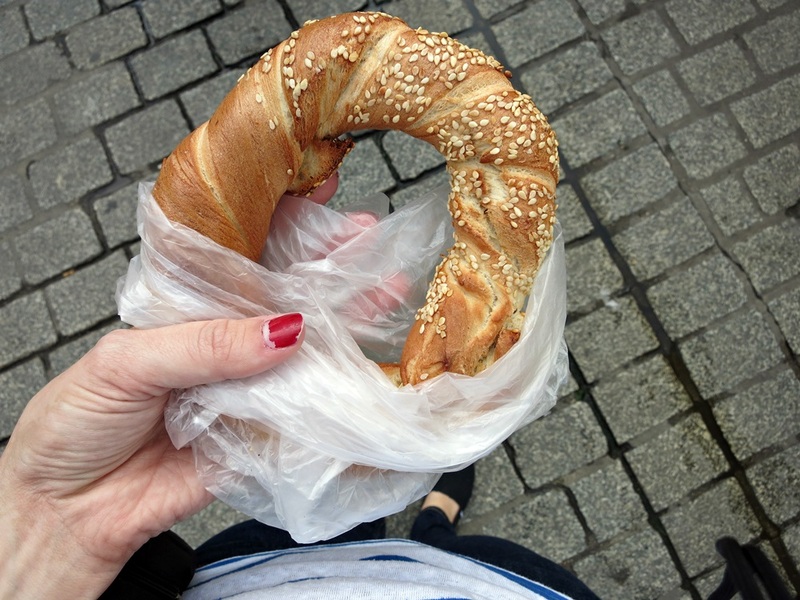 A sesame bread ring for sustenance. Here are those pigeons I mentioned. 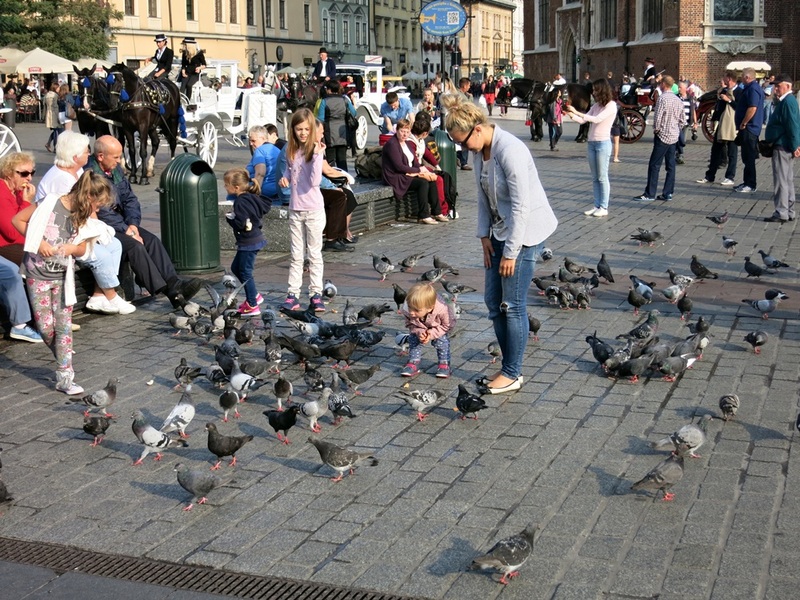 In Krakow, it’s not uncommon to literally duck and cover your head at an advancing swarm of swooping pigeons. Don’t like your sesame bread ring? Feed to it to the city’s one billion pigeons! 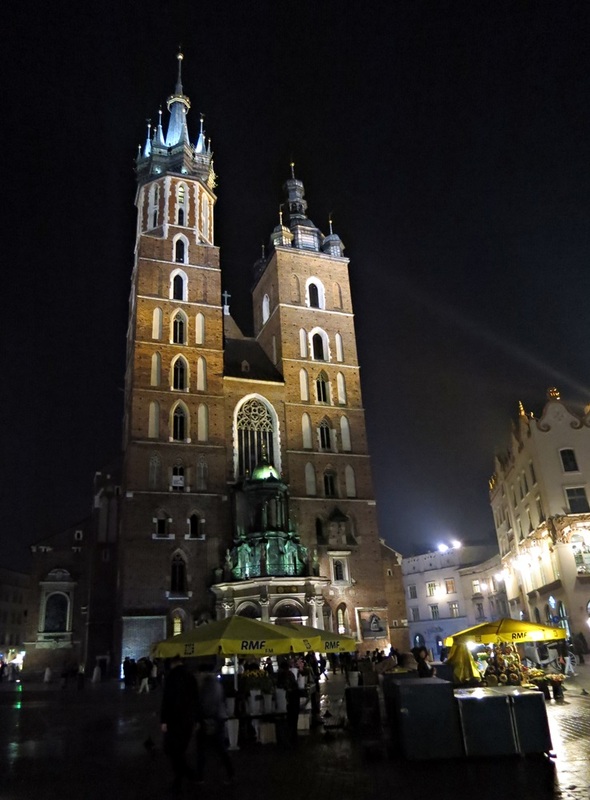 Evening settles over the main square in beautiful Krakow. St. Mary’s Basilica at night. In summary… I really, really loved my fist Polish city. I wish I’d gotten to spend more time there, but perhaps that’s why I enjoyed it so much. 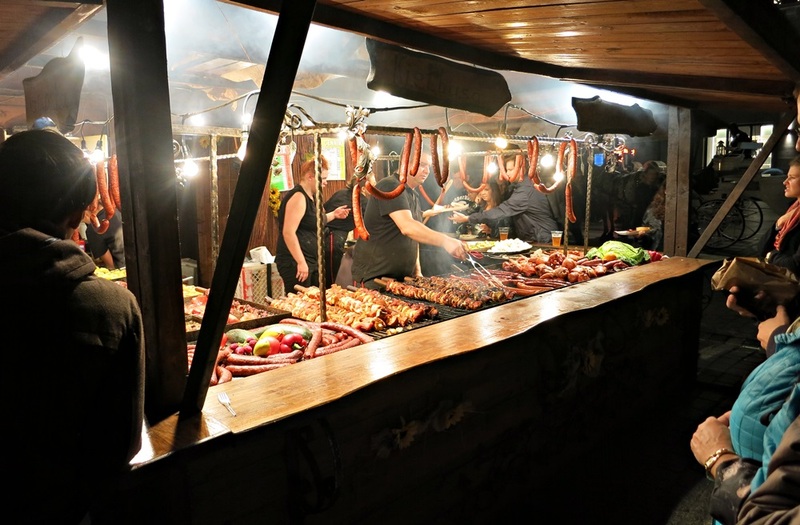 Just a taste can be thoroughly satisfying when it’s as delicious as Krakow. Up next? 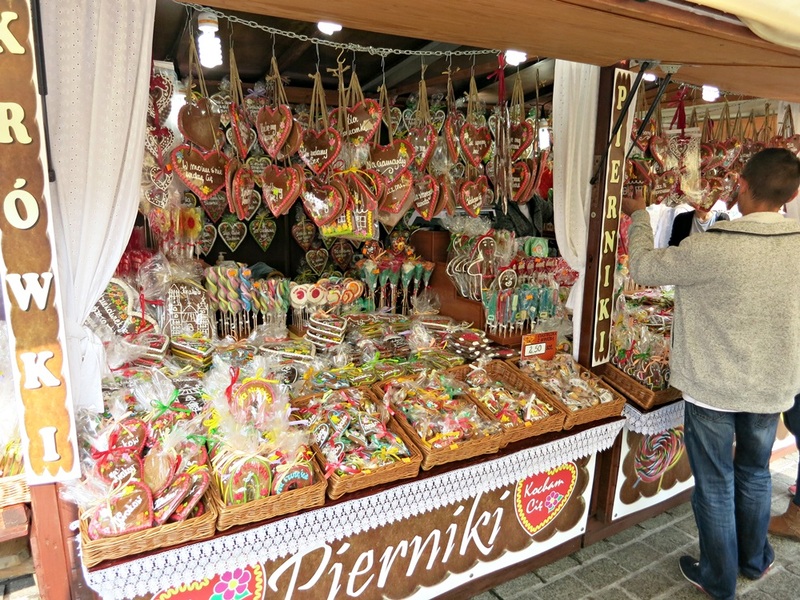 We head up into the impossibly adorable Polish Alps and ride a tank in Slovakia. Stay tuned! Tanks for the tour.Was Awesome . You’re welcome, Margaret! So glad you enjoyed it! 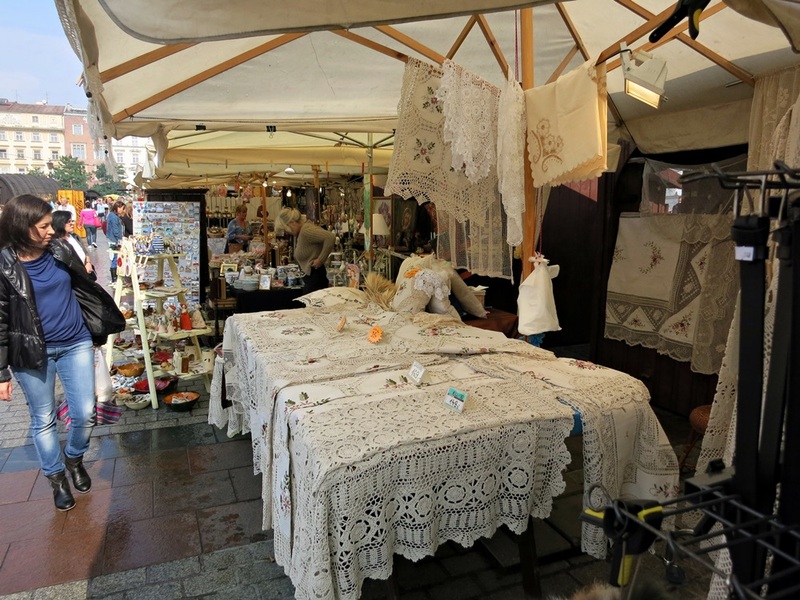 Beautiful pictures…I now understand why you fell in love with Krakow. The food and markets must have been so much fun! I would of been in awe of the holes where the torches went too. Love reading about your trip so much Aimee. Looking forward to the next installment…..